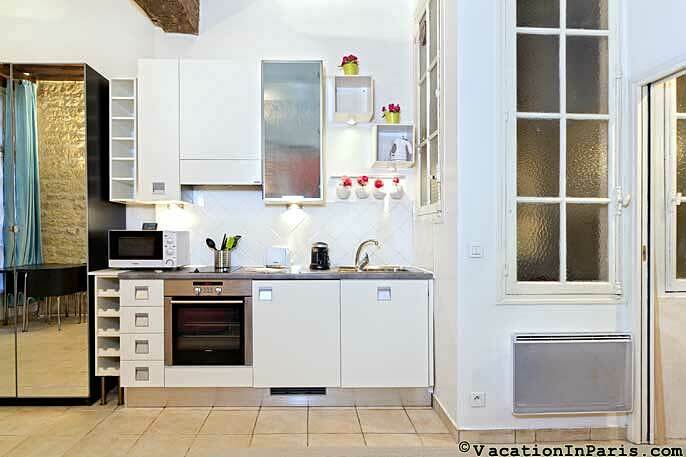 This newly renovated and authentic apartment on the exquisite Ile Saint Louis is a treasure. 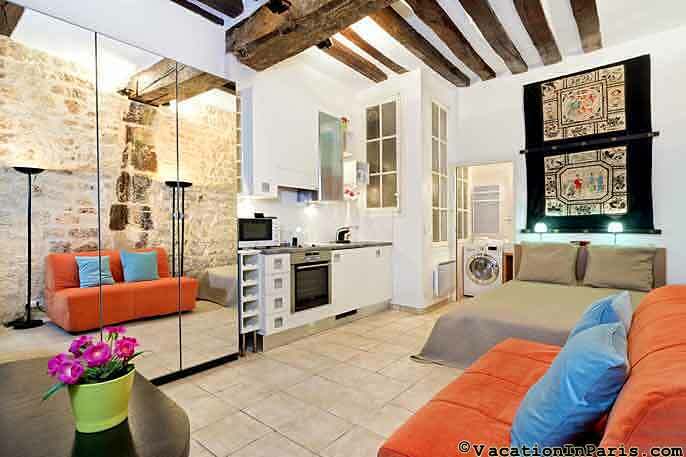 Consider the extraordinary location on this small island in the middle of Paris, just a stone's throw from the flowing waters of the Seine, and so easily accessible to both the right and left banks. 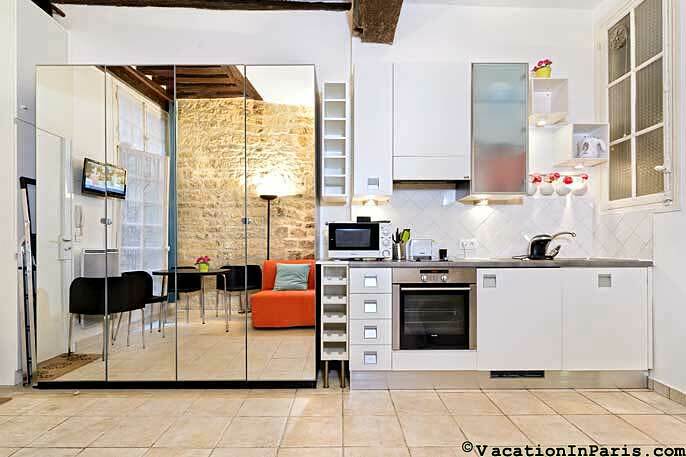 From this apartment in a historic centuries old building, head down the narrow street to the Seine, and before you looms Notre Dame in picture perfect view. 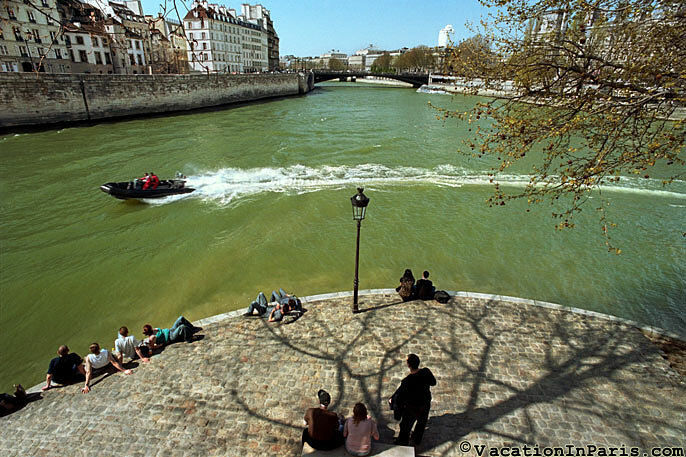 Ile Saint Louis, originally used as a pasture for grazing cattle and storing wood, is now a lively yet peaceful oasis dotted with cafés, shops, restaurants, and the renowned ice cream shop Berthillon, where people line up to get a scoop of gourmet French ice creams. The island feels clean with the river breeze, and hardly a car circulates within its cluster of narrow picturesque streets. The apartment is a rare find. 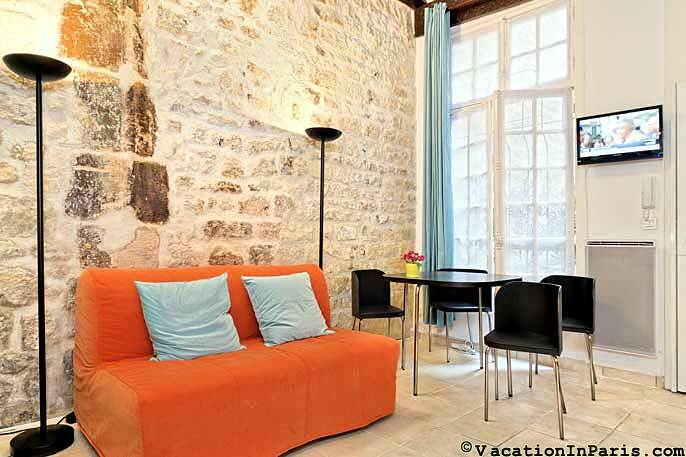 Within this historic building, dating back to the 1700's, it will undoubtedly plunge you back in time. The stone work on the building facade, the iron wrought gates when you walk through the 2nd secured door, the hanging lanterns throughout the stairwell all bring you back 300 years or more. In the courtyard is the original stone fountain used by the building occupants. The images from long bygone days are omnipresent. 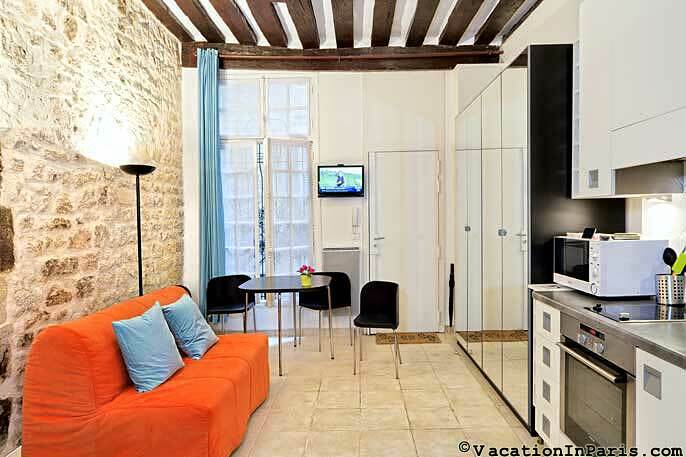 Through the courtyard and up the stone steps lined with a heavy oak banister and up one flight, you reach the apartment entrance by walking along a short passerelle protected by a wrought iron railing, all lit up by a light detector, just in case you come back late at night. 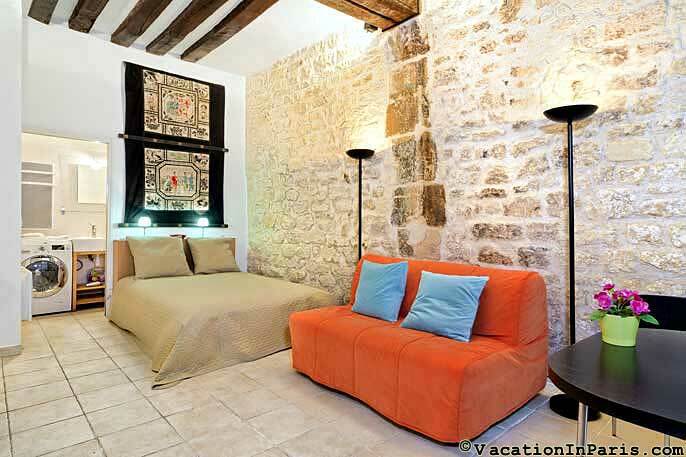 As you open the door, you enter into this unique apartment totally renovated yet which retains its original wooden ceiling beams, stone wall, stone floors, and French windows. Once inside, enjoy the modern comforts of this studio apartment prepared so carefully by its owner. 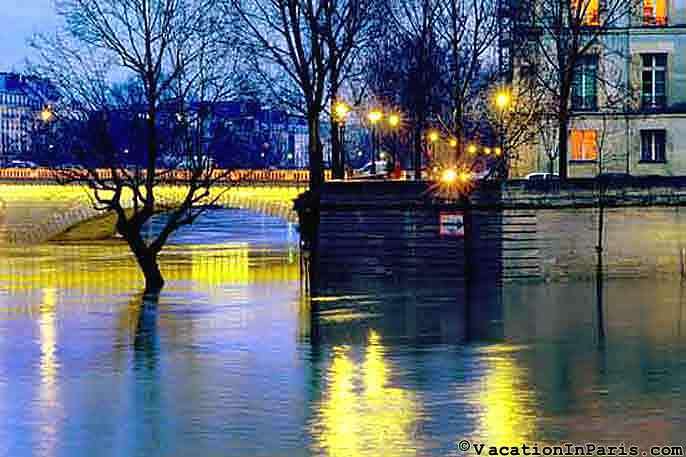 Though you are in the center of Paris, you would hardly know it, it is so quiet. The apartment is fully equipped with a queen bed, sofa bed, table for 4, TV, Internet, phone, and everything you'll need to make for a comfortable stay. 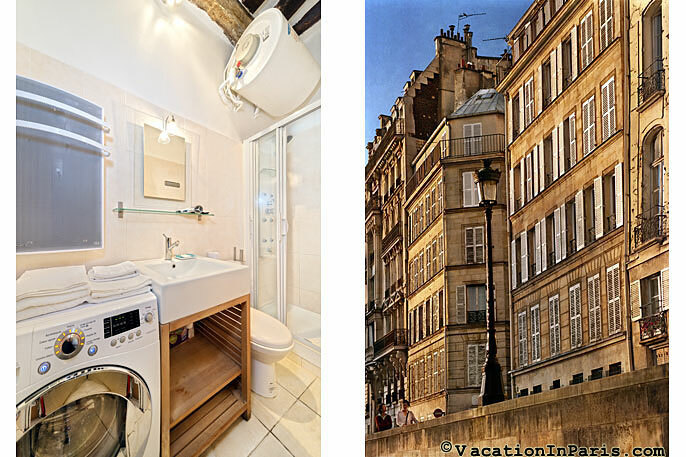 When you set out again, it's so pleasant to just meander through the streets of this island, or venture beyond to the nearby Marais on one side, or the Latin Quarter and Saint Germain on the other. Nothing so easy and so perfect as to stay here. What more could you possibly hope for on your trip to the City of Light?